This article is authored by Jeff Whisenant, President and CEO of ReSurge International, an international NGO based in northern California that to train the next generation of reconstructive surgeons in Africa, Latin America and Asia. The challenges facing women interested in a surgical career are daunting anywhere. For women in developing countries, those challenges are far greater. Yet, it is these countries that are in most need of additional surgical expertise. Today, five billion people worldwide lack access to safe, timely and affordable surgical care. Common maladies treated by reconstructive surgeons, such as injuries, malignancies and congenital conditions are far more readily addressed in countries like the US, where most families — even those without health insurance — have access to immediate medical attention and the kind of surgical intervention that can make a critical difference. In many developing countries, poor families cannot afford such medical help. As a result, injuries easily treatable in the US leave people unable to lead normal, productive lives. Children are often denied an education simply because they look differently or have reduced function of their hands or limbs. Accident victims, many burn-related, endure a lifetime of suffering and disability. All of this contributes to the more than $80 billion a year in lost productivity (wages and skills) in low-income countries. Adding to this challenge is the dearth of plastic surgeons available to perform the needed surgeries. Throughout all of Zimbabwe, there are only four plastic surgeons. In Mozambique there are two, while in Zambia, there is only one. Building capacity is absolutely necessary to bridge this gap. And one critical step to doing so is cultivating more female reconstructive surgeons. 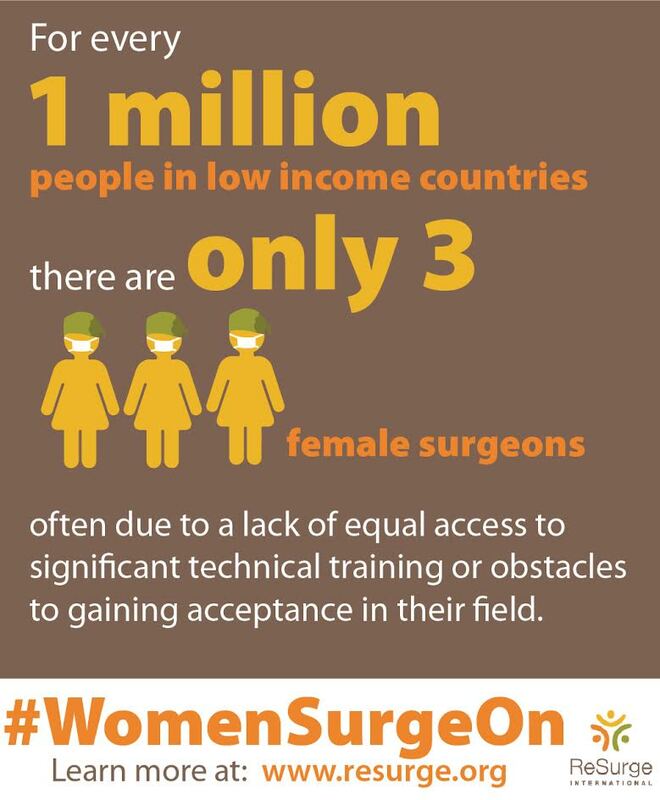 Today, estimates show there are only approximately three female surgeons for every one million people in low-income countries. The reasons behind this are complicated and include a lack of access to the necessary technical training and obstacles to gaining acceptance in their field. To help address the unique challenges women surgeons face, ReSurge International and SkinCeuticals have joined together to launch Pioneering Women in Reconstructive Surgery. This initiative provides access to technical training, leadership development, and mentor support to the first generation of local women reconstructive surgeons in developing nations. In so doing, it is also helping to foster the development of essential networks required for safe surgical care. Through visiting educator programs, leadership training, mentorship support, and funding of supplies, Pioneering Women in Reconstructive Surgery will help female surgeons grow their knowledge and develop networks of reconstructive surgical care within their communities and across the globe. The first year of the initiative will focus on six up-and-coming female surgeons from Bangladesh, Ecuador, Mozambique, Nepal and Zimbabwe. By working with world-class medical faculty, led by Dr. James Chang, who serves as the consulting medical officer for Resurge International and is Stanford University’s chief of plastic and reconstructive surgery, the ReSurge Global Training Program will educate and train these women and other local surgeons in reconstructive care. Changing the landscape for women surgeons worldwide not only helps them to advance their careers, it helps to transform the lives of the many people in developing countries in need of life-altering surgical care.